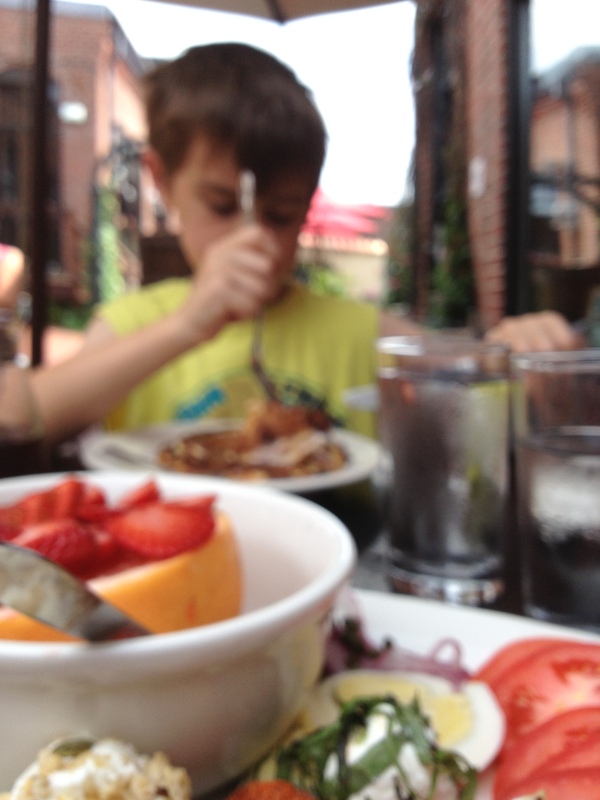 Speaking of Al Fresco Brunch… Sophia’s Grotto in Roslindale ROCKS IT! As I posted earlier, I was asked to do an al fresco brunch piece for a local magazine a few months ago. When we started talking about the piece, the editor and creative director were still looking for one more restaurant to feature, so I enthusiastically suggested Sophia’s grotto in Roslindale. MA. Much to my chagrin, they didn’t consider Roslindale to be part of “Boston”… so I got the thumb’s down. However, I respectfully disagree. Anyone who lives in the JP/Rozzie/W. Roxbury area knows that Roslindale is most certainly part of Boston… I have past tax bills to prove it! Sophia’s Grotto is our favorite restaurant in Roslindale… so I decided to do a brunch write-up on it anyway. Not only are the food, staff and hosts great… did a I mention the amazing patio that is perfect for both dinner AND brunch dining? 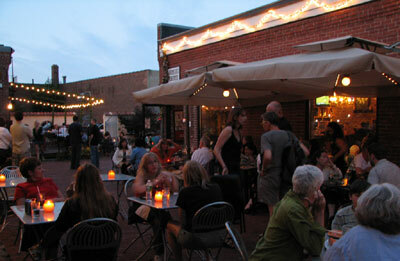 Always a hot spot, this patio is a little oasis hidden in a very urban environment. 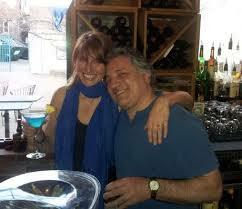 Brunch is served every Saturday and Sunday from 10:30am to 2:30pm and the patio is where it’s at. On most weekends it’s absolutely packed with both locals and those who travel from outside Roslindale’s boundaries for the deliciousness that awaits them. The brunch menu at Sophia’s is a mix of both classic and eclectic Italian bistro fare… with favorites including the Sweet Sophia — a decadent honey, cinnamon and maple syrup roll, a steal at $2 each and the Meat or Vegetable Stratta — both brioche and egg layered casseroles ($7.95 each), which sound delicious. As does the rest of the menu that includes many options from the dinner menu (including wood-fired pizzas, salads, pastas and warm sandwiches). The menu has so many things to choose from that I had a hard time picking. I wanted something filling but fresh and not too heavy. 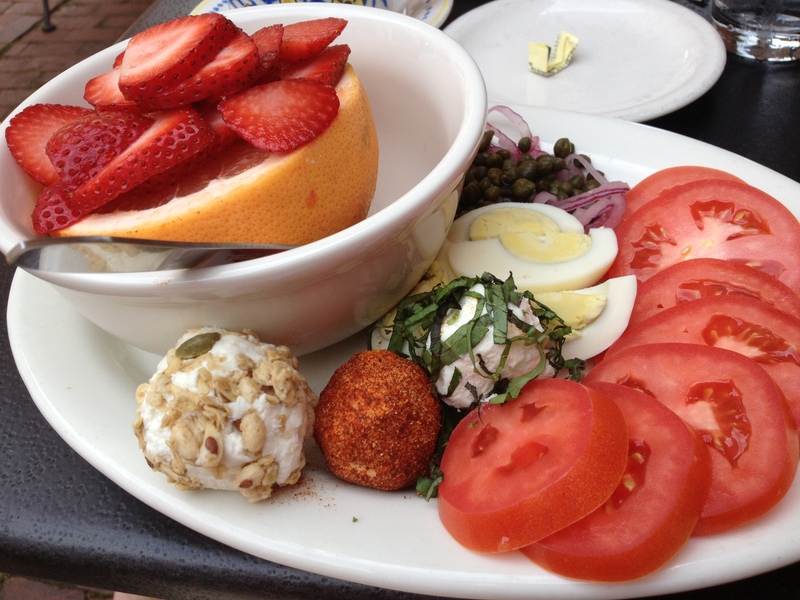 I decided to go for the Breakfast Antipasto — Hard-boiled eggs, sliced ripe tomatoes, red onion, capers, three types of herbed goat cheese, grapefruit, fresh strawberries AND toast with sweetened cream cheese and a honey drizzle ($8.95). I satisfied my sweet cravings, savory cravings, salty cravings and desire for healthy food all in one dish! The presentation was so stunning that I couldn’t stop taking pictures of it. 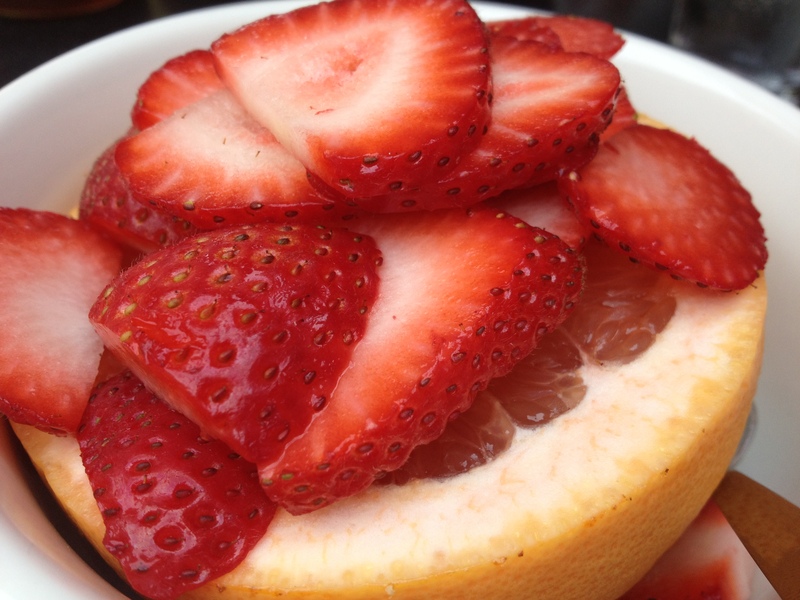 The grapefruit was ridiculously sweet and the strawberries were just as good… sweet, succulent and perfectly ripe. Not your garden grocery store variety. 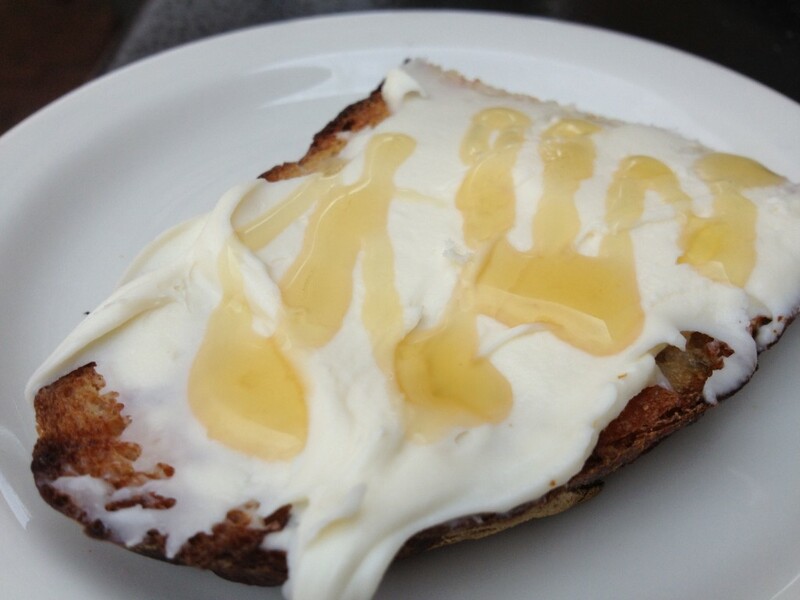 I believe the toast was probably a slice of rustic Italian bread or brioche with (as promised) sweetened cream cheese and a hefty drizzle of honey. This was a splurge for me… as I’ve for the most part given up wheat and gluten. I couldn’t resist though. It was just sitting there… calling me name. I inhaled it. 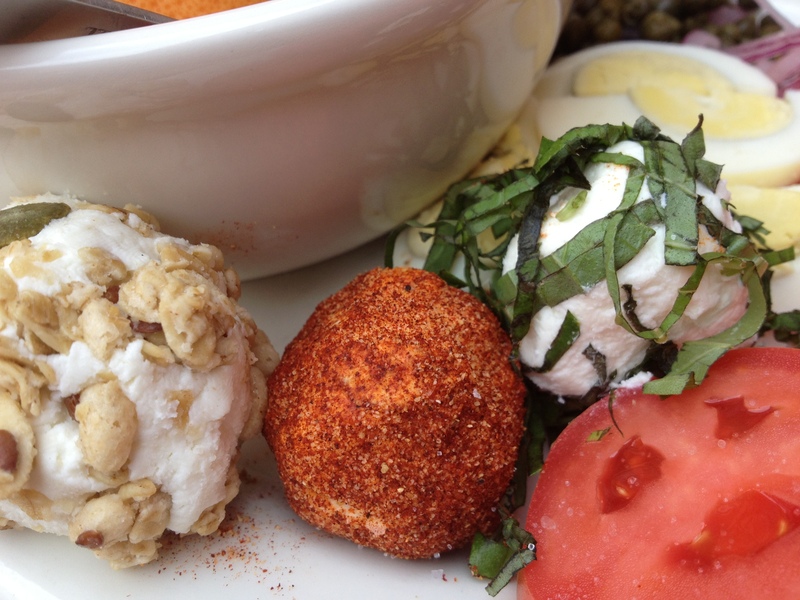 The plate included three little goat cheese balls… all seasoned with different herbs and such. The first was covered in a sweet mixture of nuts and what tasted like a little granola. The second had what appeared to be a spice blend of paprika and some other savory and salty seasonings, but it was not in the least bit overpowering. The third had been rolled in a basic basil chiffonade… which was light and refreshing. 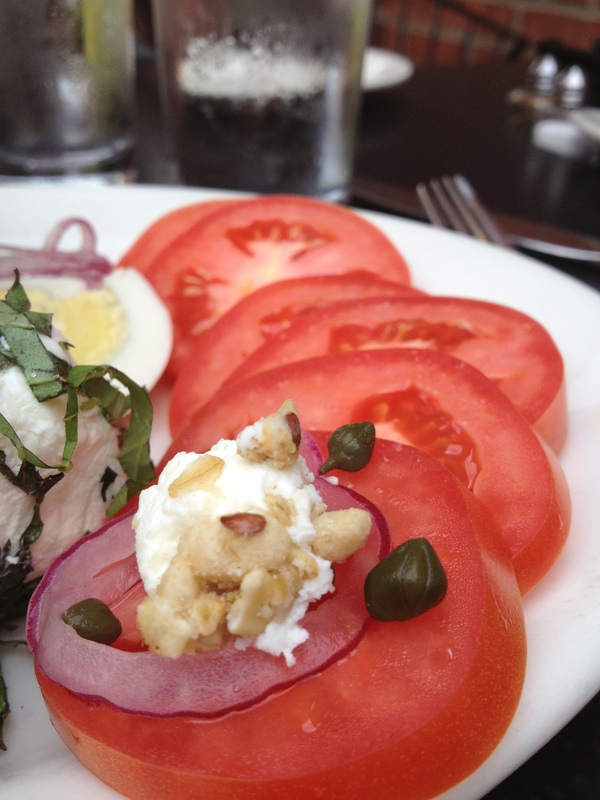 I loved pairing the tomatoes with the goat cheese of my choice, some of the paper-thin shaved onions and a few capers. The entire dish was delicious and I thoroughly enjoyed every single bite. 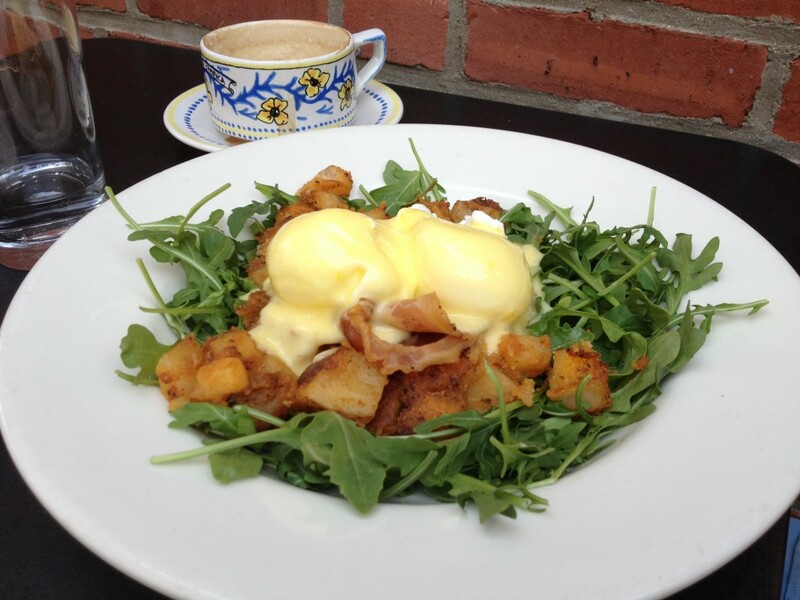 Dan (my husband) got the Eggs Benedict — 2 poached eggs, pancetta, hash browns over a bed of arugula, topped with hollandaise sauce and toast ($9.95). It was just as stunning… spicy arugula, perfectly seasoned breakfast potatoes and the pan-fried pancetta paired beautifully with the perfectly poached egg and the sauce. Did I mention they have really good cappuccino too??? 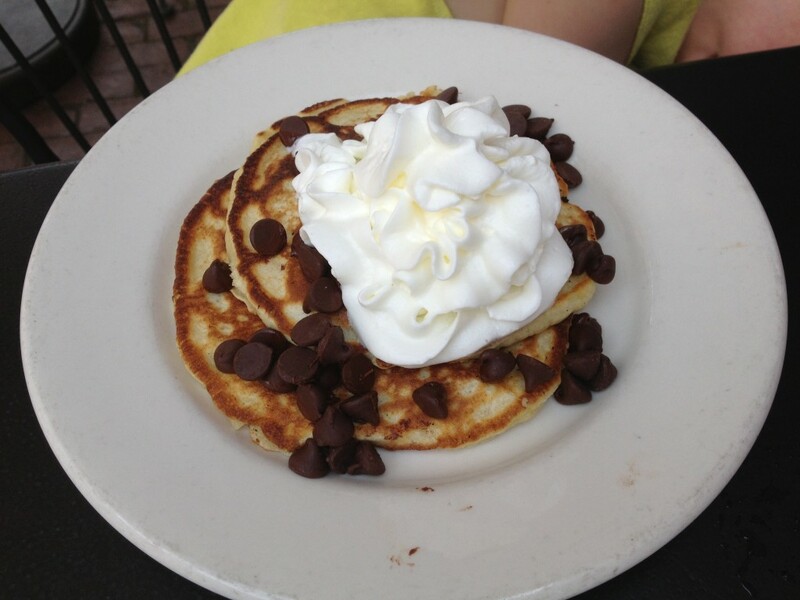 A must-have for any brunch goer…. We have certainly found a place for brunch that we will travel to time and time again… even though the shop is closed and we moved to Dover, MA over a year ago. It’s worth it.